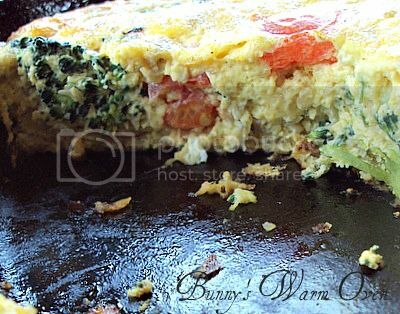 About.coms Culinary Arts says that...".In the culinary arts, a Frittata is a flat Italian-style omelet that's usually prepared in a cast-iron skillet. 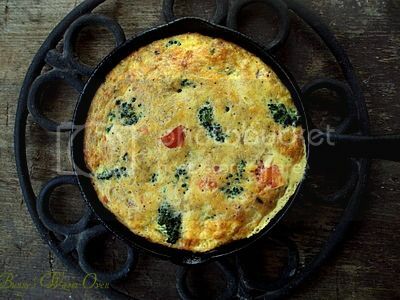 A brunch menu classic, the frittata may also have its origin in Spanish cuisine". To Read More, Click On The Recipe Title. Whether it's origins are Spanish or Italian, this is a favorite brunch item in this house. I have laying hens that give me 5 fresh eggs a day and 10 pullets that will be laying in a couple months. All those fresh organic eggs mean ....I can make a whole lotta Frittatas! This is a culmination of two Frittata recipes, I took what I liked from the two and made one. Feel free to switch out the vegetables to what you have on hand or add meat like bacon, sausage , ham... or chicken! It's all up to you. 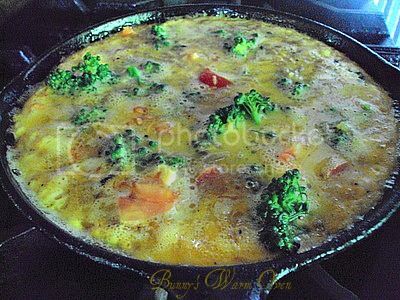 This particular Frittata was made with broccoli, tomato, sauted onion and garlic, cheddar cheese, 5 eggs and 1/4 cup of water. Why five eggs? Paul wanted an extra egg, he wanted to make sure he got his fair share. I wish I would have had a green pepper to saute with the onions and garlic, eggs and green pepper are sooooo good together! I will next time! Get all of your ingredients ready. I love to saute onions, garlic and green peppers and put them in the Frittata, it adds so much more flavor! 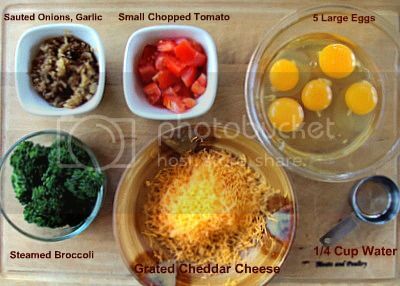 I grated the cheddar cheese, about 3/4 cup to put in the Frittata, you can put it on top if you prefer. 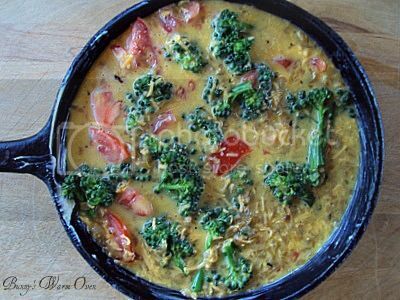 If your making this to serve 4, use a 10 inch nonstick pan or cast iron skillet. Since it was just the two of us eating ,I made the Frittata in an 8 inch cast iron skillet, and halved the ingredients. 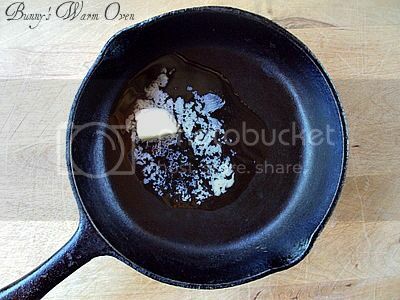 Place the butter in your skillet, heat the skillet enough to melt the butter. 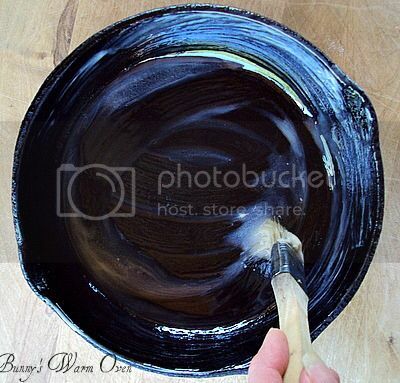 Using a pastry brush, coat the pan with butter, don't forget to coat the sides as well as the bottom of the pan. I sauteed my onions and garlic together ahead of time, I like them a little more caramelized than they would have gotten sauteing in the pan with the other vegetables. Put all your vegetables in the pan , cook and stir 3 minutes. Season the eggs with salt and pepper and what ever seasoning you enjoy. I put a little cayenne pepper in just to give it a little pizazz. 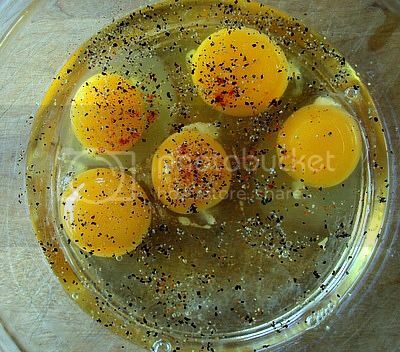 Whisk the eggs along with the water , add the grated cheese and stir. Add eggs to the vegetables in the pan. Look at all that goodness waiting to be cooked. 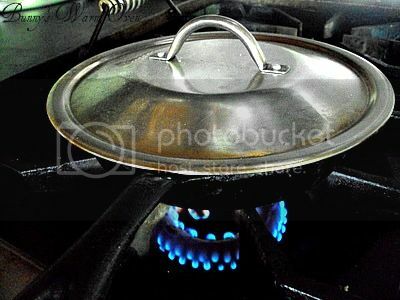 Under medium to low heat put the pan on the stove and cover it with a lid. Let it cook on top of the stove until it's cooked on the bottom and almost set on top. To finish the top off, put the pan under the broiler in your oven. If you wanted to put cheese on top , this would be the time to do it. 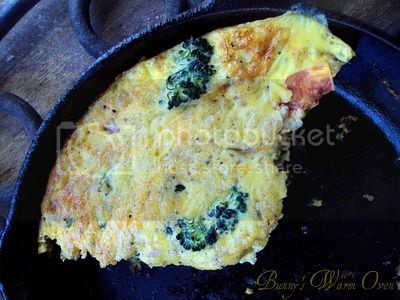 If you cooked the Frittata all the way through on top of the stove, you'd risk burning the bottom. Is that gorgeous or what! I can't wait for the garden to start producing, just think of all the different veggies you could use in this! And don't forget the meat you could add. This is all Paul left , my portion, you can bet I enjoyed it. Met butter in 10 inch nonstick skillet or cast iron pan over medium heat. Add vegetables, cook and stir 3 minutes. Lightly beat eggs, water and seasonings. Pour egg mixture over vegetables in skillet. Cover and cook 10 to 15 minutes or until eggs are almost set. Remove from heat and place under oven broiler, until top is set. 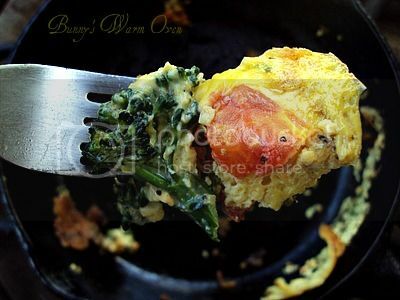 Here is another way to have scrumptious eggs for breakfast or brunch! I love how versatile fritttas are - you can pretty much throw anything into them and they're always good. For some reason, this one is particularly calling to me. Lauren we love breakfast for dinner in this house! And yes they are soooo versatile! Thanks for stopping in!